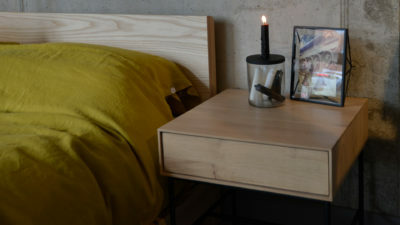 Let me introduce you to the newest addition to our range- the Hoxton. Based on our extremely popular Camden bed, the Hoxton contemporary bed has the most striking headboard of any of the beds in our collection. The chevron pattern shows every variation of your chosen timber- lighter sections contrast with deeper tones, more distinct grain patterns are placed across from more subtle pieces to create a truly eye catching design. 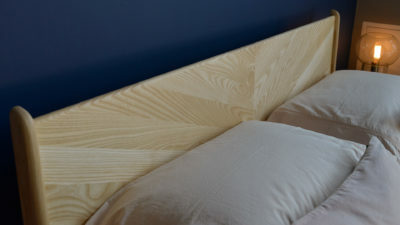 You can see these differences on other beds in our range but previously they would have been spread around many parts of the base- on the side rails or the footboard for example- here everything that makes our hardwood timbers so beautiful and unique is found in the headboard panel. 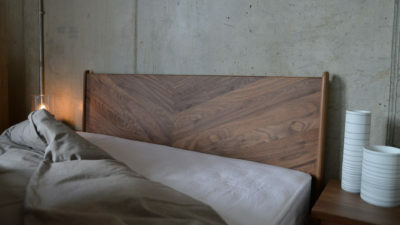 Timbers with more variation in tone and grain, such as the walnut, cherry, ash or oak make ideal choices for the Hoxton, clearly highlighting the chevron design that makes up the headboard panel. 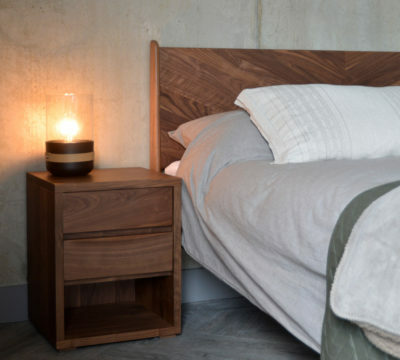 We currently have examples of the bed base in walnut and ash currently on display in our Sheffield showroom; vastly different timbers in both colour and grain but both perfect choices to accentuate the headboard pattern. 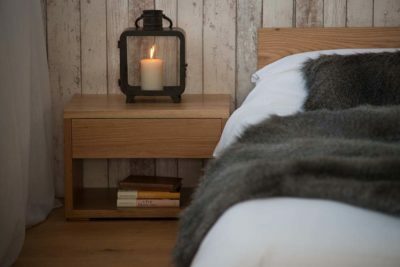 Although the headboard is undoubtedly the focal point of the design, it does not overwhelm the other elegant details that make up the Hoxton. 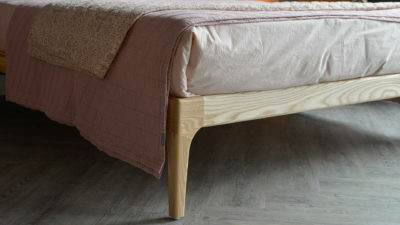 The grain patterns on the leg sections, while subtler, work to compliment the more obvious ‘statement’ sections. 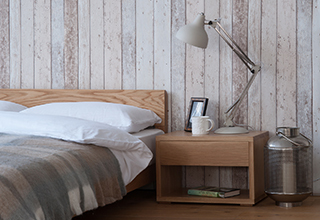 You’ll want to show off as much of the striking headboard panel as possible, so with this in mind, I would advise pairing the Hoxton with a mattress no more than 25cm in depth. 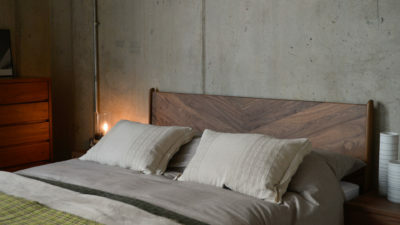 Any deeper and you will find that the lower sections of the headboard become obscured by duvets and pillows once the bed is dressed. overall length: 208cm for a 200cm long mattress; 198cm for a 190cm long mattress. 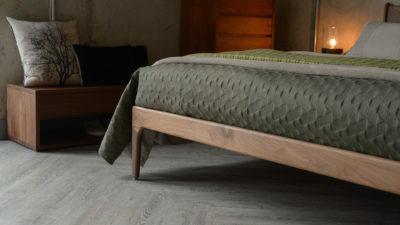 If you are looking for a statement bed, something eye-catching but without the large footprint of a base like our Oregon, then the Hoxton is the perfect choice. The combination of the striking headboard and the elegant mid-century details combine to create a distinct design without taking up the entire room. 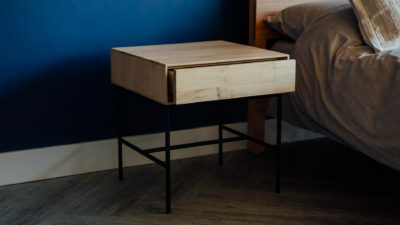 The bed itself is only 6cm wider and 8cm longer than the mattress, allowing you to add a bedside table such as the Low Cube bedside or Ethnicraft Whitebird table even in rooms where space is at a premium. 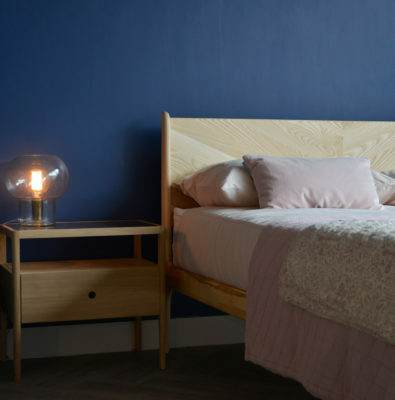 If you are having trouble deciding on the timber for your Hoxton contemporary bed, get in touch either via our timber sample request form on our website or over the phone on 01142721984 and we can send out small samples of each of the available timbers we offer. The Hoxton looks even better in person than in the photographs online. 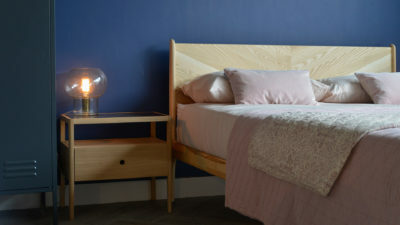 If you would like to take a closer look at the bed and the furniture to pair with it, we would love to see you at our Sheffield showroom. We are open Monday to Saturday 10am-5:30pm (excluding bank holidays).